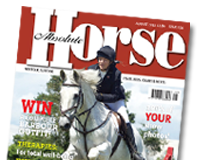 Taurus Footwear is proud to announce their sponsorship of Michaela Huntington, regular Absolute Horse contributor of ‘Kyla’s Corner’. Taurus strongly believes in supporting hard working, inspirational riders, and current British Showjumping National Amateur 1.10m and 1.15m Show Jumping Champion, Michaela, certainly fits the bill! Michaela rose through the Pony Club ranks as a child, representing Great Britain in her youth with a variety of ponies, and moving onto horses with Zerro, a horse that she won the Blue Chip Star final with twice. The pair went on to compete internationally in a British Nations Cup, Hickstead Derby and Horse of the Year Show.